How to Effectively Use The Viral Music Toolkit to Get Heard and Go Viral. Recently I’ve been talking about a tool for musicians called the Viral Music Toolkit and music player. Every so often a tool will capture my interest, especially when a new tool or technique is going to be useful for indie musicians to navigate, adapt and provide an new opportunity to thrive in music’s new landscape. So, How Exactly Does The Viral Music Player Work? The short answer is that The Viral Music Player focuses and defines that moment of online interaction between listener and songwriter/recording artist. What do I mean by, “focuses and defines that moment of interaction between a listener and your song”? “Hey, nice to see you. We should get together sometime.” And then you both go on your way, with no real expectation that you will actually get together. This is what the Viral Music Player strives to do – it turns a fleeting, almost meaningless encounter and gives it purpose and clarity. In other words, the moment now has been given the chance of becoming a relationship because the Viral Music Player creates actual engagement between the listener and your music. 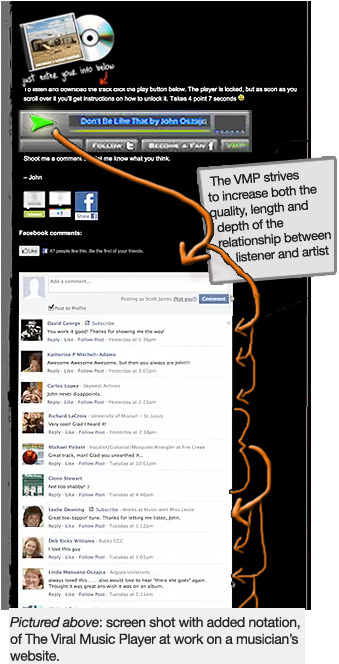 Use the Viral Music Tool to give your listeners much more than they were expecting. Their positive (and motivated) response when they realize this, will be the spark for the tool so it can better ignite the viral chain reaction you so desire for your music. Believe me, there are very few things that are as exciting. Yes, I know, you are initially using the tool to enlist them to make your music go viral, but when your goal and intentions are positive, and you set up the tool in a way that gives back even more than they have given to you (by spreading your music far and wide) – then this becomes a very powerful tool indeed.